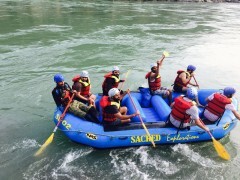 This rafting trip in Rishikesh takes you from Brahmapuri to Muni Ki Reti. You'll spend one hour battling the rapids of the Ganges, and will encounter rapids like Double Trouble, Hilton, and the Terminator on this 11 kms stretch. At the end, you'll paddle into calmer waters, and will try a bit of body surfing and cliff jumping. This rafting trip is ideal for anxious first-timers or for those looking for a relaxed adventure on the Ganges. Rishikesh is also known as the 'gateway to adventure', thanks to its perfect location at the foot of the Himalayas. From here, you can set out in any direction and will find gorgeous trekking routes through pine forests. Some of the most famous rivers in India gush down from their origins in the misty Himalayas, and meet in Rishikesh before heading down to the plains. These glacier-fed rivers form Grade III and IV rapids as they churn over rocky beds, giving you world-famous rafting stretches to experience. You can choose from the many rafting stretches, from 9 kms to 36 kms to encounter some of the biggest rapids in India like The Wall, Double Trouble, Three Blind Mice, Terminator, Golf Course, Club House, Roller Coaster and Return to Sender. 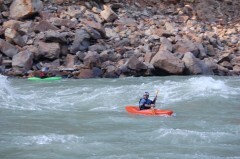 • Battle Grade II rapids on a 11 kms stretch from Brahmapuri to Muni Ki Reti. • Encounter rapids like Double Trouble, Terminator and Hilton. • Try your hand at cliff jumping and body surfing. • Soak in scenic views of the lower Himalayas. Smoking, consumption of alcohol, tobacco and drugs is strictly prohibited during this Rishikesh rafting trip. Littering is strictly prohibited in or near the water bodies. Participants must adhere to the instructions of the rafting guide at all times. Only 8 participants will be allowed in one raft. Empty your pockets and put your valuables in waterproof pouches during your Rishikesh rafting session. For cancellations made 30 days or more before the Rishikesh rafting trip date: 75% of the trip cost will be refunded, minus any transaction charges. For cancellations made 15-30 days before the Rishikesh rafting trip date 50% of the trip cost will be refunded, minus any transaction. 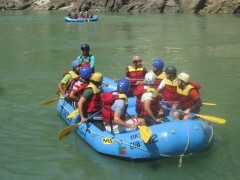 For cancellations made 0-15 days before the Rishikesh rafting trip date: No refund. 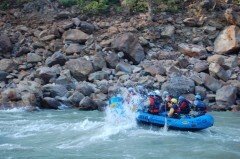 The operator reserves all rights to change the venue/date/schedule or to cancel the rafting trip in Rishikesh. In case of injury, damage to self or property or death during the Rishikesh rafting trip, the operator shall not be held responsible. 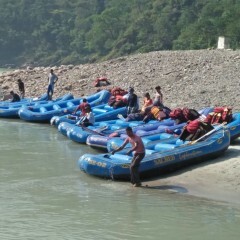 All decisions made by the operator are final and participants must abide by the instructions and decisions of the instructor during rafting in Rishikesh. Adventure activity is arranged considering normal weather. In case of cancellation of this Rishikesh rafting trip due to reasons beyond control such as natural calamities, riots, political uncertainty, logistic issues, etc., refund shall be payable with respect to the given cancellation policy. Arrive at the operator's site office at 08:30 hours and you can offload your luggage here. You'll be driven to Brahmapuri, the start point for the 11 kms rafting in Rishikesh and you'll be briefed about the security measures and rescue techniques. After this, you'll begin your thrilling rafting trip. Encounter small, Grade II rapids like Double Trouble, Hilton and Terminator along the scenic stretch. On the calmer stretches, you'll also try your hand at body surfing and cliff jumping in the river. Your rafting session culminates at Muni Ki Reti and your trip ends here. Any meals, packaged water, beverages, telephone calls, etc. Any costs arising due evacuation, emergency situation, etc. You'll have to report at the operator's site office which is near Rajmahal Hotel on the Badrinath Road in Tapovan. 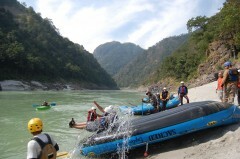 The operator will arrange your transport to the start point for your Rishikesh rafting trip.